I think it's finally time for Tim 'Ripper' Owens to get some recognition beyond being the latest replacement for another metal band. We all know the now apocryphal metal story: fan becomes lead singer for his heroes, Judas Priest But Owens also subbed for Matt Barlow in Iced Earth too, and lately he replaced Doogie White in Malmsteem's band. With his first solo album, Play My Game, in his twenty plus years career, Owens finally steps out of the shadows of his past and delivers a barnburner. If you love heavy metal, with the emphasis on heavy, in the classic tradition, you will devour Play My Game. To make his solo debut even more impressive, Owens recruited a Titanic size crew of supporting musicians. I'll try to list the most recognizable; here we go: Bruce Kulick (lg, Kiss, Grand Funk Railroad), Rudy Sarzo (bass, Ozzy, Whitesnake, MSG, and lately Blue Oyster Cult), Billy Sheehan (b, David Lee Roth, Steve Vai, Mr. Big), David Ellefson (b, ex-Megadeth), Marco Mendoza (b, Blue Murder, Whitesnake, Derek Sherinian, Thin Lizzy, et al), Tony Franklin (b, Derek Sherinian, Lana Lane, The Firm, Blue Murder), Simon Wright (drums, Dio, UFO, MSG, AC/DC, Rhino Bucket), John Comprix, guitarist from Owens's other band Beyond Fear, Jeff Loomis (g, Nevermore), Steve Stevens (lg, Billy Idol, Vince Neil, solo), Carlos Cavazo (lg, Quiet Riot, Ratt), Doug Aldrich (lg, Dio, Whitesnake), Michael Wilton (Queensryche), and Chris Caffery (lg, Savatage, TSO, John Olivia's Pain, solo). With a line up like that and Owens on the mic, Play My Game should be a veritable masterpiece. Well, it is, almost. On the positive side, Owens has never sounded better. Yes, he will never escape the comparisons, but on this disc you hear him and his natural style which will always integrate his influences. (Frankly, I never thought he sounded like Halford; he always reminded me of Dio. But that's personal opinion.) If he sounds like Halford at all, then it's Angel Of Retribution Halford on 'To Live Again.' Second, much like Derek Sherinian's latest work, the showcase performers may be the lead guitarists. Most every song bristles with fantastic fret work. This is quickly followed by the masterful bass work especially from Sheehan on 'The World Is Blind' and Franklin on 'The Light,' and then the drumming, as from Bobby Jarzombeck on the same number. Conversely, in terms of song composition, there is a lot of redundancy on 'Play My Game.' This is a strong dose of very heavy classic heavy metal. I'm not talking brutal or punishing like current metalcore (et al) trends, but rather a constant overwhelming barrage without much variation. Don't read this the wrong way. I'm a huge fan of this form of metal, and Owens and company bring it on. But at times it was repetitive to the point of predictability and ambivalence. 'Starting Over' isn't quite the powerful start I expected, but it's qute melodic and Owens develops an unusual vocal arrangement. 'Believe' strikes hard at the classic early Dio sound of heavy metal probably in large part thanks to Craig Goldy's guitar work. 'The Cover Up,' a psuedo sci-fi tale, brings melodic heavy metal with the pace of power metal. The guitar solo from Jeff Loomis of Nevermore is one of my favorite's on album as is the song. What follows is the reduncancy and predictablity I mentioned earlier. From 'Pick Yourself Up' through 'The World Is Blind' the riffs are strong, thick and monotonous. 'To Live Again,' the second best song on the album, gives some pause as it's slightly lighter arrangement allows the melodic tone to surface. But then it's off again to more of the preceding. At the end, Owens again escapes the monotony with the fantastic 'Shadows Are Alive,' delivering a pure piece of melodic heavy metal. With Play My Game, Tim 'Ripper' Owens finally stands on his own showing us and the world (what he already knew): he is not merely a replacement singer, but rather one of the best metal singers of our time. Even with some compositional redundancy, with Owens at the mic and the huge cast of top players backing him up, Play My Game is an impressive solo debut. Highly recommended! 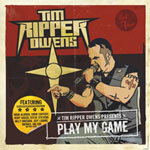 With Play My Game, Tim 'Ripper' With his first solo album, Play My Game, in his twenty plus years career, Owens finally steps out of the shadows of his past and delivers a barnburner. If you love heavy metal, with the emphasis on heavy, in the classic tradition, you will devour Play My Game.